More than 13 mins of Open-World Gameplay in this new trailer. Boy, the world is huge! Most of it is sea but the sheer number of Islands means there will be plenty of travelling. Good that there will be "fast travel" points to make it easier but the seas are filled with activities to do like Harpooning and probably ship-wrecks on the seabed. Assassination Contracts from caged pigeons are back! There is a certain pleasure from retrieving assassination contracts from these pigeons, don't you agree? The seamless transition from land to sea and then back to land is evident a bit later. Definitely a plus, if it's always as smooth as what we see from the trailer. On the Jackdaw, you also have many options of bombarding the enemy ship. Glad to see Ubisoft put in a lot of effort to make the Naval Battles exciting and realistic. Hopefully, this will make each and every Naval Battle unique. No loading times when you board another ship as well! I like it that you can choose what to do after taking over the ship. You can add the crew to your own, send the ship to your fleet or even salvage it to repair your Jackdaw. 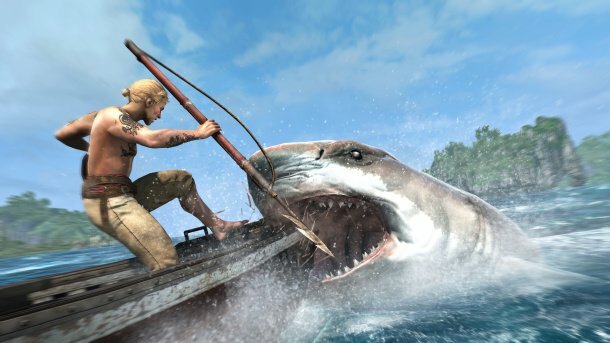 Treasure hunting, Water Spouts (Tornados in the sea), Mayan Ruins, Pirate Crew recruitment all add to the rich Open-World of Assassin's Creed IV's Caribbean setting. You will also acquire a new "throwing weapon" in the Assassin's Creed series - Berzerk Darts. It looks to be similar to the poison darts that we have seen in the past games where you hit a guard with one and he goes berzerk on everyone around him. Probably crafted from one of the many poisonous plants/fruits found in the Caribbean. One of my favourite parts of this trailer is at 08:45. You can get your crew to sing!!! Sea Shanty is what they call it. Haul on the Bowline! In AC IV, you can collect Sea Shanties (Hope I spelt that right) for your playlist for your crew to sing. I'm pretty sure I'm gonna sail around in circles just listening to all the different songs, long after I complete AC IV. Hope you guys enjoyed the trailer as much as I did!